Wooden masks from Bali with intricate carvings, handmade and handcarved by master craftsmen. Beautiful carvings mask by Balinese wood craftsman who make wooden masks for years in small village in Bali. Available in various faces, smiles and sad masks. To use as wall hanging or wall decorations for your home or office. 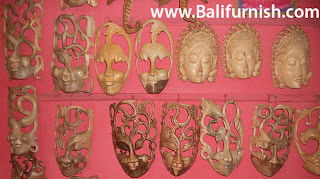 If you been to Bali, surely you have seen wooden masks on wall.